This is Cold Steel's pair to the Warrior series' katana: the Warrior wakizashi. 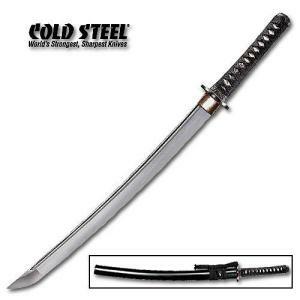 The retail price is the same as the katana, though this sword is eight inches shorter. The wakizashi's blade, handle, and components are all crafted identically to its katana counterpart. The fully-sharpened, battle-ready blade is 1055 spring tempered high carbon steel, while the handle is wrapped with genuine sami and fitted with brass menuki. The Warrior series of Cold Steel swords is very similar to Imperial lineup of swords. However, the expensive mirror polishing process has been eliminated from the craftsmanship, making the Warrior blades cheaper than the Imperials. They're not cheap, though, just cheaper than the Imperials. We'll link to the Imperial below if you're interested in the mirror polishing. If you're going to buy a Cold Steel blade regardless of whether or not it's cost-effective, the Warrior series won't be a bad set to own. But if you're just shopping around for a battle-ready sword set, this wakizashi is not going to help you. Check out some of Ryumon's battle-ready swords, just for starters.